The Ranger Inn in Bangor. On April 25, 2005, a tenant at the Ranger Inn on Outer Hammond Street in Bangor made a phone call to the city: The carpets and walls were constantly wet in Room 220, the tenant said, according to a record of the complaint, and there was mold or fungus growing behind the headboard. An inspector from the city’s code enforcement office confirmed the problem, finding a humid room with “mold growth on many surfaces” and “large fungi growing from the floor behind one of the beds.” The city instructed the owner at the time, Joel Ranger, to remove the sheetrock and carpet to fix the problem. On July 11, 2011, a tenant in Room 323 called the code enforcement office: His girlfriend had bug bites, and he had caught a live bed bug, according to the office’s records. The bug is still preserved in those records, behind a piece of tape. The code enforcement office noted in its records that Ranger called a pest control company. In 2012, there were more complaints about bed bugs, and wet carpets and floors. Someone complained about outlets falling out of the wall. Someone else said wires were hanging, and there were no smoke detectors. After further inspections in more recent years, the city discovered significant problems with the electrical system, boilers, sprinklers and plumbing. In each case the city issued notices of violation and often instructed Ranger to fix the problems within a specific time frame. Sometimes he corrected the issues, and other times he did not. When he sold the 67-room Ranger Inn last year, the new owners, Paul Cook and Jesse McCue, inherited issues they estimate will take three to four years to fix. Bangor’s handling of repeated violations at the Ranger Inn, which rents rooms on a weekly and monthly basis, offers a case study in how the city errs on the side of being more collaborative with landlords, generally refraining from more extreme measures such as shutting properties down and taking landlords to court. City officials said they take that approach because people’s homes hang in the balance, and they don’t want to make them homeless. In many cases, the court process could take as long as the needed repairs. At the same time, without many other enforcement mechanisms, it often means people’s living conditions can remain poor for long periods of time. Complicating matters is the fact that public money often goes toward supporting the very landlords who aren’t able to keep their properties maintained to city requirements. Even as violations persisted over the years, the Ranger Inn remained a common destination for tenants who paid for their accommodations with General Assistance, which is administered by the city. The emergency aid for basic needs is funded with 70 percent state dollars and 30 percent city dollars. In the most recent fiscal year, the Ranger Inn’s ownership company collected the fifth largest amount of General Assistance in the city, $32,639, to rent rooms to low-income tenants, according to city records. In fiscal year 2017, the owner collected $30,361, the seventh largest sum. The rooms currently go for $759 per month, with a $150 damage deposit, for a studio with a kitchenette, according to the Ranger Inn’s website. Even as it is subsidizing the rooms, the city currently has no ability to withhold that money to spur the Ranger Inn to correct code violations more quickly. And without routine inspections, the city can’t see whether rooms meet certain quality standards before dispensing the aid. General Assistance is the only rent assistance program that doesn’t require inspections, meaning the city often doesn’t find out about problems unless a tenant calls to report them. Many tenants, however, don’t know they have the option of calling in a complaint to the code enforcement office, and others fear retaliation from their landlords, said Brenda Bilotta, the licensing coordinator in Bangor’s code enforcement office. Still, enough people have called to report issues at the Ranger Inn to draw continued attention. In the last 28 years, since 1990, inspectors confirmed 24 sets of violations of the city’s building, electrical and fire codes, according to a Bangor Daily News review of the property’s code enforcement file. The property’s managers corrected some problems, albeit slowly, and allowed others to persist, even as the code enforcement office repeatedly told them to fix the problems. Twenty-eight days later, however, instead of bringing legal action, it sent another letter with similar language reminding Ranger of the legal ramifications. When the problems weren’t fixed in 30 days, it followed up with more letters on Feb. 1 and Feb. 16, telling Ranger to fix the issues within 30 days or else face prosecution in court. Given that the buildings needed major electrical upgrades, by July 25, 2016, former housing inspector Bub Fournier was making his unease known. “I am very concerned that many of the violations I observed in the units continue to go unabated. Our office has been very patient in hearing from you or your contractors,” he wrote to Ranger. When Cook and McCue bought the property from Ranger in May 2017, they inherited the outstanding code violations and have already spent more than $100,000 on the property. Much of it went to demolishing one of the property’s four structures. “We have made an agreement with the city that we are working as fast as we can to correct these violations, and the city has allowed us to continue to do what we’re doing here,” Cook said. There is the “last resort,” Bilotta said, of taking landlords to court, but the city rarely uses it, instead continuing to press the responsible landlord to correct problems. Repairs take time. Redoing the electrical circuitry throughout the property requires removing sheetrock, Cook said, and electricians are in high demand. Many are already booking into the coming spring. If the city doesn’t prefer prosecution or use the option often, however, why tell property owners they will face court action? Cathy Conlow, Bangor’s city manager, said she’s open to taking more people to court, but the goal is to obtain compliance. She is looking to a housing work group convened by the city to come up with recommendations by the end of the year. “If there are properties that are substandard and unsafe, then we need to address this. How we address this is something I’m hoping the housing group will help us with,” she said. Taking landlords to court is not ideal because of the amount of time the process can take, said Greg Payne, executive director of the Maine Affordable Housing Coalition. There are other mechanisms that the city could institute to gain more leverage, however, such as by requiring inspections of rentals and withholding General Assistance when apartments fall below a certain standard. Another option could be to create a registry of apartments, something Portland already has, and Lewiston has discussed, as a way to reward landlords who are maintaining their properties and provide information to potential renters. An online rating system could, for instance, show the buildings that haven’t been inspected or where property owners refused to allow an inspection, or where there are outstanding code violations, in addition to providing information about who to contact in an emergency. “It’s difficult when you hold yourself to a certain standard and you’re making a lot of investments … and down the street you have these dilapidated buildings that are poisoning kids on their way home from school, practically, with the lead dust coming out of them. We want our community to be safe,” said Amy Smith, a landlord in Lewiston who supports the idea of a registry. 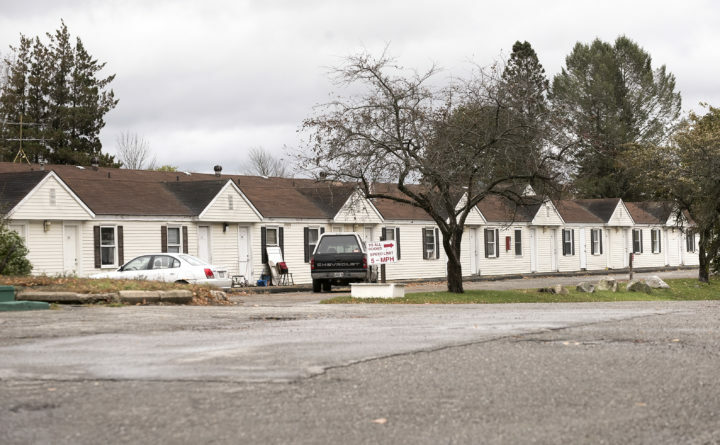 She sits on a committee that’s exploring how to improve the health and safety of rental housing in Lewiston and rents out 13 apartments, most of which are funded with federal Section 8 vouchers. She welcomes and is used to inspections, as the Section 8 program requires them. But the process could be streamlined, she said. Four different entities — Lewiston Housing Authority, Lewiston code enforcement, the Lewiston Fire Department and the social services agency Community Concepts — all conduct inspections of her property under different circumstances and look for slightly different problems. “I love the idea of an annual, well-understood inspection where they basically say, ‘These eight things are really serious, and you have to fix them now. These other 10 things need to be fixed by the next inspection.’ That helps the property owner plan,” she said. There are also times when tenants ruin apartments, and the landlord doesn’t have the money to make repairs. There are already programs to help landlords cover the cost of removing lead. What about other serious hazards? “Could the city buy an insurance policy for landlords in the event that the damage is well beyond the security deposit? Could there be an insurance policy that covers tenants who trash the place?” Smith said. Bangor currently has a few more ways to get landlords to make needed fixes other than taking them to court. For instance, it has the ability to find a home unsafe for human habitation if the code violations are severe, such as if there are major structural failings or no heat. If that happens, the code enforcement office orders the building or apartment “placarded” or “condemned,” and the tenants have to move out. That has not happened at the Ranger Inn. City inspectors have to permit and then OK the landlord’s repair work before the units reopen. And that’s when some of the code enforcement office’s most important work happens, Bilotta said. “We certainly make sure that when there’s construction done, it’s done correctly to start with,” she said. With the Ranger Inn, the code enforcement office has one other mechanism to compel compliance with the city’s property codes. As a lodging establishment that rents out rooms on a weekly or monthly basis, it’s required to hold a city-issued innkeeper’s license. Cook and McCue applied for a license renewal on Aug. 23, but the city hasn’t yet granted it because of the outstanding code violations dating back to the previous owner. So the Ranger Inn is currently operating without a city-issued license, but it holds a state-issued lodging license.